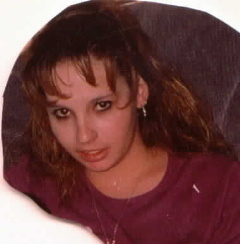 My younger daughter, Crystal Lee Houston, 24, was found dead in her home in Socorro, New Mexico, on April 15, 2001, just fourteen months after the murder of her sister, Stephanie. She was found lying on her back on the floor with her sweatshirt pulled up over her face and her sweatpants and underpants pulled down around her thighs. Crystal had been severely beaten and had sustained blunt force injuries to the back of her head and contusions and abrasions to both legs. There were heavy marks on her neck. On the autopsy report, the Office of the Medical Investigator (OMI) listed the cause of death as "undetermined," because Crystal had drugs and alcohol in her system. Crystal was devastated by her older sister's murder and had sought to escape her pain by descending into the drug world. On the night of her death, Crystal met up with a couple of guys and they went home with her to party. The police have identified those men, one of whom had recently escaped from a halfway house. That man had spent the past eight days in Socorro, walking around in broad daylight, making no attempt to hide, but, despite the fact that the city and state police and the District Attorney had all been notified of his dangerous presence there, they had made no attempt to pick him up. That suspect was later found in Albuquerque, in possession of Crystal's car, and had even been trying to cash some of Crystal's checks. The police say he can't be prosecuted for Crystal's murder because she had drugs in her system and the Medical Investigator won't give a definitive cause of death. I have a copy of the report from the Toxicology Office that was released after OMI released the autopsy report. According to the toxicology report, Crystal didn't have enough drugs or alcohol in her system to kill anybody over the age of twelve. Yet, OMI refuses to change their findings - (or lack of findings) - in view of this new information. I wish there were a way to let the whole country know what is going on here in the state of New Mexico. The problem is that people who haven't personally experienced this injustice don't want to get involved with it or even to know that it exists. They just want to go on with their own lives. When my daughter, Stephanie, was run over by her jealous boyfriend and the State Police refused to do anything about it, everybody in our hometown was outraged. But their anger wore off. Now they're going about business as usual. As for Crystal's death -- everyone here just seems to want to let that alone, as if it wasn't important. I am about the only one left who is still trying to get something done about the murder of either of my daughters. Thanks to the relentless efforts of Bill Houston and his private investigator, Mike Corwin, the Socorro Police Department finally buckled down and did its job. In July 2006, Crystal's killer was brought to justice. Jurors took four and a half hours to find Ramon Lopez guilty of a combined charge of felony murder and the alternative second-degree murder, kidnapping, criminal sexual penetration, taking of a motor vehicle and tampering with evidence. Bill Houston says, "It took me a long time, but I finally found someone in law enforcement who said, 'This is murder, and we are going to take him down.' This could happen on every case if the victim's family can find that one honest, determined investigator who is willing to make an all-out effort to get a case solved. In the case of my other murdered daughter, Stephanie Houston, that didn't happen." Bill says he is also grateful to District Judge Matt Reynolds for the work he did presiding over the case. "The truth was brought out during the trial, and that's what brought the guilty verdict," Bill says.